The IFCBA Board of Directors meeting will be held in Brussels, Belgium on April 30-May 1 and you don't want to miss it! This is an excellent opportunity for IFCBA directors and observers to meet with customs broker colleagues from around the world and with WCO officials at our Board meeting. Subjects of discussion will include the WCO's review of the Harmonized System, an IFCBA Certificate program on International Customs Fundamentals, the Trade Facilitation Agreement and E-Commerce. You won't want to miss this opportunity to hear from others and share your priorities. To register now for the IFCBA Board of Directors meeting, please click here. 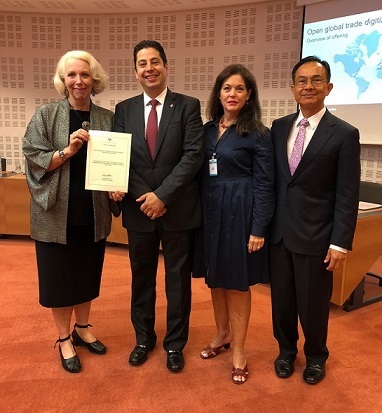 At the recent meeting of the World Customs Organization Private Sector Consultative Group (PSCG), WCO Deputy Secretary General Ricardo Treviño presented the IFCBA with a certificate of recognition for its work as a member of the PSCG 2017/2018. If IFCBA members wish to download and/or print the certificate, it is available here.